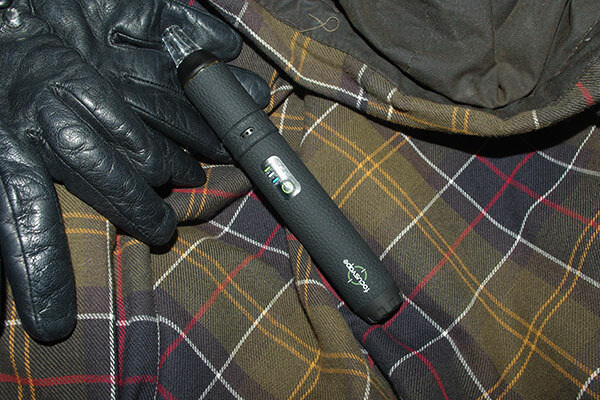 The Focusvape Dry Herb Pen Vaporizer Review-Get Focused! I haven’t given the Focusvape fair treatment and I’ve been remiss in writing a product review for it (the shame); with so many pens coming out of China that are lesser quality, it’s easy to generalize and make assumptions about how a new device measures up. I admit it…I was dead wrong. 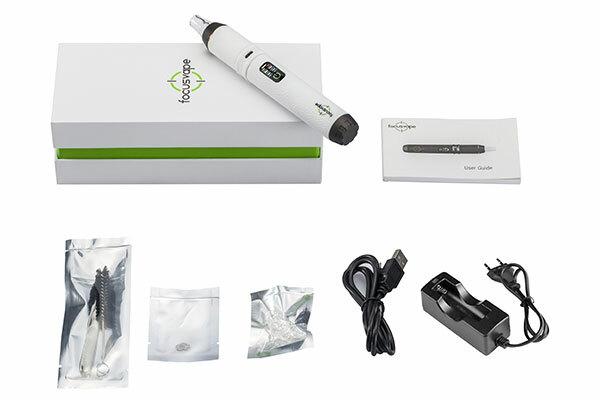 The Focusvape is actually a surprisingly good quality device that we like better that a lot of other lower cost herb vaporizers like the Flowermate, Smite and the like. I gave the Focusvape a really good trial, and I have been changed…I have seen the light through the clouds! Let’s have a closer look at the Focusvape below. The Focusvape measures about 1″ in diameter and is about 6-3/4″ long, so you can’t easily conceal it in your hand, but it is small enough to tuck in your pocket or bag quite easily. The feel of the device in your hand is really nice. The Focusvape weighs a hefty 182 grams and has a feel of substance and quality, unlike some of the light, cheaper, plastic devices out there. The casing is coated with a faux-leather silica gel that is tough, gives a nice cushioned feel, and is heat resistant to stand up to the oven’s heat, and protect your hand as well. Focusvape comes in four unassuming, attractive colours: Coffee, Black, White and Olive. The mouthpiece is high quality Pyrex glass, and there is a spare in the box, just in case you break one. One innovative feature of the Focusvape is the sliding airflow ring. Fresh air from just below the oven is drawn through three holes that can be partially blocked by the sliding ring to adjust flow. On the opposite side of the ring is a micro USB port for charging the removable battery (yep…it’s removable!). The unit has a single button control that is easy to use. If I had to come up with a criticism, the button would be it. Don’t get me wrong, it works fine, and is easy to use, but I’m personally not crazy about bubble buttons, which this is. I like a “real” button. We see a lot of lesser quality batteries with some pens, but Focusvape went the distance in providing a high quality LG, 2,500 mAh, High Drain Battery that will last many users for days…seriously. That battery can be charged while in the unit using the USB port behind the airflow ring, and the unit does have pass-though function, so you can continue to use it while the battery is charging. But the really great thing about the Focusvape, is that the battery can be removed, giving you the flexibility to replace the battery, or have a pre-charged one ready to go! In a relatively low-cost device, this is kind of unheard of. Oh! It also comes with a separate battery charger! That’s pretty sweet! The heat time is truly impressive heating from room temperature the maximum temperature in under 30 seconds. When it is time to recharge, it takes a while…we found it was about 3-4 hours, so having a second battery is probably a good idea. Keeping good care of the battery helps it last for hundreds of charges and years of use. 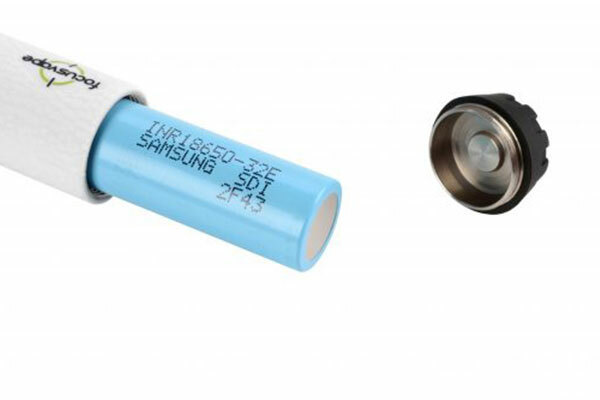 Dropping the battery will dramatically shorten its life and could create a dangerous internal short. Lithium Ion batteries should be treated with care to keep them safe and effective. The Focusvape is easy to use, with its single button and has a short learning curve…I referred the the manual (where the English is fairly well written compared to some imports) twice while I was learning, and felt like I got it after that. To unlock and lock the unit, you press the button four times. 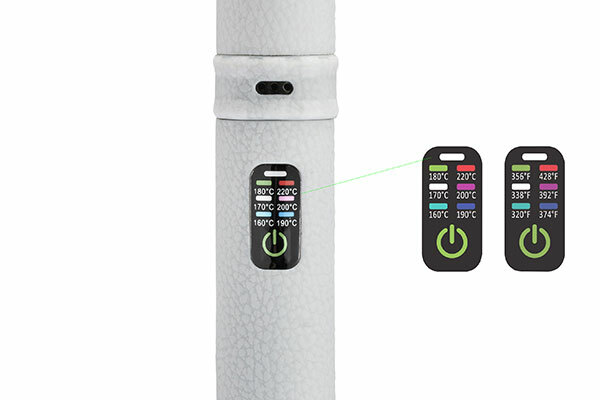 When the unit unlocks, the Focusvape will vibrate, and show the battery charge level as high, medium or low (white, green and red respectively). Pressing another four times locks the unit, and it vibrates again as it shuts down. Once unlocked, pressing the button again for 2 seconds starts the oven heating to the last temperature set-point that you used. the light colour for the particular setting will flash as it’s heating, then go solid when it reaches the set-point. The unit also vibrates in case you aren’t looking. Continuing to press the button for 2 seconds, cycles the temperature set-point through each of the 6 temperature settings of 160, 170, 180, 190, 200 and 220 degrees C. I found these settings gave me more than enough variation to dial in my vaporizing experience perfectly well. The heat -on time is 5 minutes, after which the unit goes into standby, or Sleep Mode for 3 minutes. While the unit is in Sleep Mode, pressing the button for 2 seconds start the oven heating again. If the unit is left in sleep mode without touching the button, the Focusvape vibrates and locks itself out again when the 3 minutes is up. It was easy to unscrew the mouthpiece and load the herb in the top of the device, and the steeply tapered and amply sized opening to the oven ensured that no botanical spilled over the edge. I was really impressed with the Focusvape. I was expecting a sort of wispy vapour that you might get from some other lower cost vaporizers, but again, I was mistaken. The oven is a good quality ceramic unit that is very capable of producing the little richer vapour. I like a juicier experience, and when I used the Focusvape with some nice fresh botanical, I got a seriously rich, thick, respectable cloud that wasn’t at all hot, but just nicely warm. It was quite lovely. The air pathway is well considered taking in fresh air, moving it through a food-grade section, then the oven, and finally through the mouthpiece so that the botanical doesn’t have any nasty flavour imparted on it at all. The airflow is pretty good in the Focusvape offering a resistance that I would call moderate-to-good. I found myself switching between a direct inhale, and ‘sipping’ when I found it too resistive. It doesn’t have the unrestricted flow of very high end units like the Crafty, but it’s not bad either; a slow steady draw straight to the lungs works great. As I mentioned before, the Focusvape has a sliding adjustment ring to partially cover the fresh air inlets, but I never felt like I wanted to further restrict the airflow. Packing the botanical with a light firmness seems to work well in this conductive device. The Focusvape was a pleasant surprise for me…I love surprises, and I can admit when I’m wrong. This is a well-constructed, really great performing traveler that I can certainly recommend as a good value at the lower end of the cost spectrum. It is a much better device than I thought it would be. I’ve seen devices on other sites rated higher than the Focusvape, and to be honest, I don’t think those ratings hold up. In my opinion, the Focusvape is way better than the Flowermate and similar brands (which we don’t carry) for example. But I don’t think it’s as good as the Utillian 721. 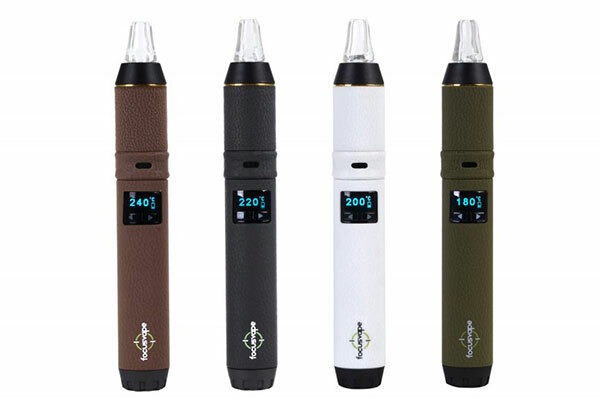 A removable battery with excellent life, good temperature options, a selection of colours, easy use and above average performance at the price all add up to make the Focusvape a new fave that I feel good about offering to our clients. 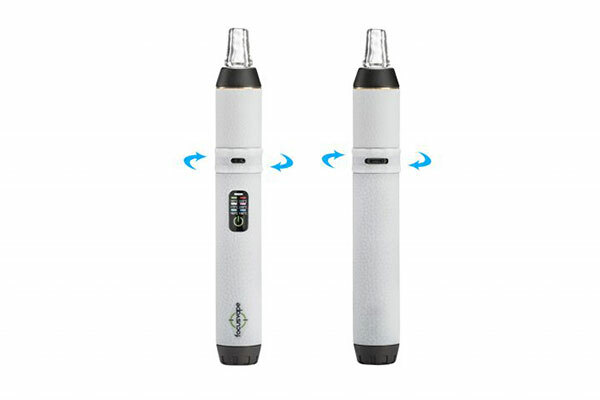 Focusvape provides a one year warranty on the unit, except the glass and battery. Our President smoked for almost 4 decades. Seeking a better way, he discovered vaporizing and LOVED it, so he founded Rocky Shore Cannabis Corp to help others make the switch. He is our resident expert and device guru, having personally selected, tried and tested every device we carry. David is absolutely passionate about helping others learn about and transition to vaporizing in favour of smoking. He loves what he does, and is always thrilled to talk to people about which of our high quality devices will best serve their needs. Arizer Air II Vaporizer Review-Air Force!